Fixed IP address included at no extra charge. 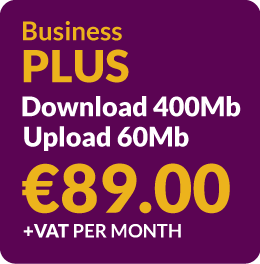 Business Plus brings the Internet to your business premises. You can now connect your whole corporate LAN to the Internet giving everybody in your organisation instant always-on Internet access. We can deliver such high speeds because we use our own fibre powered network. Cablecomm Bundles gives you all you need bundled together in the best value deals. CableComm TV gives you access to 98 digital and analogue channels.